My family has been making this for years. 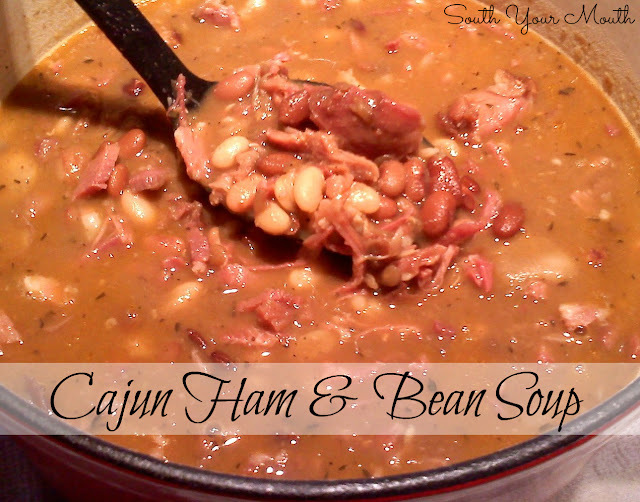 My dad found a Cajun variety of 15-Bean Soup Mix that takes dried beans and ham to a whole new level. But it's really hard to find. And if I have a hard time finding it in South Carolina then I'm sure the rest of you will find it damned near impossible. When I can't find it (which is more often than not) I just use the regular Ham Flavored 15-Bean Soup Mix and add spices. Just use whatever you can find and use the seasoning packet that comes with it (if it doesn't come with a seasoning packet, increase the salt by 3/4 teaspoon). Add ham bone (not ham), soup mix (with seasoning packet), water and remaining ingredients to a large soup pot or Dutch oven. Bring to a boil then reduce heat to medium-low, cover and simmer for 4 hours. Remove ham bone. Trim away all the meat from the joint and bone and add back to the soup pot; give the bone to your dog. Add the additional 2 cups chopped ham and stir well to incorporate. Cover and continue cooking on low for 2-3 hours or until beans are tender. I like to serve mine over white rice (how to cook Perfect Rice Every Time). *use either the ham flavored or plain 15-bean soup mix (if your mix doesn't come with a seasoning packet, add 3/4 teaspoon salt). If you do find the Cajun variety, disregard the spices and seasonings in this recipe and go with the packet - salting to taste. **I only ever serve this over rice so I make it on the salty side (since the rice is bland). If you plan on eating this sans the rice you may want to reduce the salt a bit. How salty your ham is plays a roll in this too. Start with 1/2 teaspoon then salt to taste when it's completely done cooking (you will draw salt from the ham the entire time you're cooking). I hope that makes sense!